On Sept. 2, my first evening on my own in Japan—well, since the summer of 1982—my longtime friend Elly Shiozawa and I finally had a long telephone conversation. Once she learned that I had travel ideas but no bookings for my second week, she kindly invited me to spend the following morning at her house in Setagaya, where she would act as my travel agent. Elly's house is in a quiet neighborhood. As I entered I said, "Ojama shimasu," something new from my phrasebook that I had never learned in my two years of college Japanese, which literally means, "I'm going to get in your way" or "I will disturb you." Inside her house it's easy to see that two professors, their kids, and their three cats spend time there with various bookish and computerish pursuits. (OK, actually the cats get a scratching post.) Elly graciously spent the whole morning phoning hotels to make my plan for a loop through the Japanese Alps possible, and then she and her husband took me out to an Italian pizza lunch. Time passed with all the catching up on family news, and suddenly it occurred to me that I needed to get to Shinjuku station and to my hosts that I had no idea how to find the bus terminal. So Elly, not for the first time, got on a train with me to be sure I got to the bus for Matsumoto. 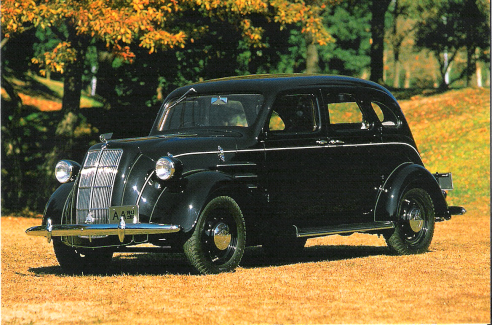 If you look on a map, you can see Matsumoto is located in a valley in the center of the Japanese Alps. Originally I chose the location for the likelihood of cool weather; I got more than I bargained with Typhoon Talas, though it ended up crossing Japan to the west of my location. The bus took the Chuo Highway. At Futaba rest area I was interested to see the fruit stands and bought a couple of apples. The rain began around then, but I enjoyed the picturesque landscapes once we reached the mountains. 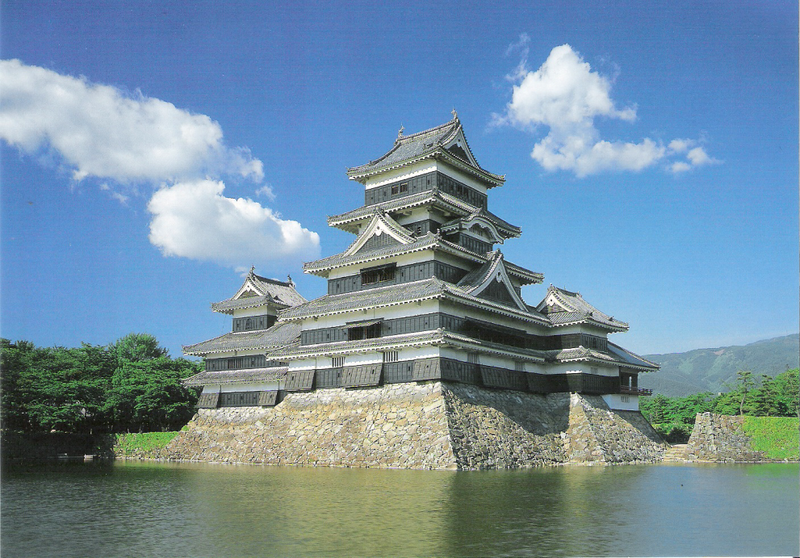 Postcard of Matsumoto Castle by Shinichi Sasaki. 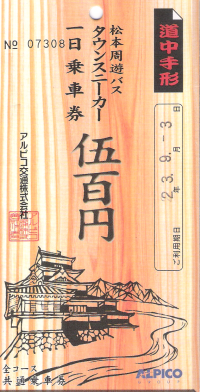 When I arrived in the dark and rain I chickened out and took a taxi to the Marumo Inn, a ryokan that the owner informed me was built in Meiji 23 (1891). After washing up I explored Nakamichi-dori ("middle-of-town street") and chose an empty restaurant because of its English menu. This was unfortunate, but I found I generally needed to learn what was on the menu first and could then order in my Japanese. I was happier when the guidebook showed me restaurants that are known for particular specialties. Across the street I saw a sign: "We can't speak English but we'll do our best!" The next morning I had a lovely Japanese breakfast at the inn. I got a day pass (left) for the Town Sneaker Bus for 500 yen that let me ride three different routes. I stopped at the station to put my backpack in a locker, Matsumoto Castle, the former Kaichi School, and the bus terminal. At the castle the first thing I saw was a swan in the moat. As I paid to enter the castle, a free English-speaking volunteer offered his services for a private tour. Until then, I hadn't realized I was the only non-Asian tourist around. 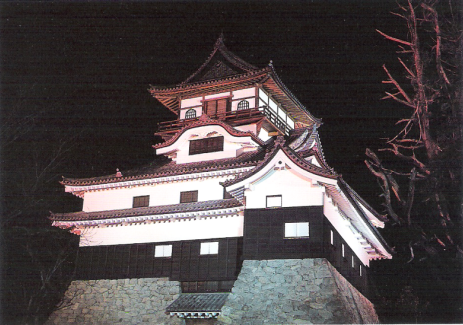 The highlights were the hidden, windowless third floor, intended for warriors to hide in during wartime but used for storage; the Tsukimi-yagura, or moon-viewing tower; and the armory exhibit. Less popular but still interesting was my other sightseeing stop, the former elementary school (right) used from 1876 to 1963. 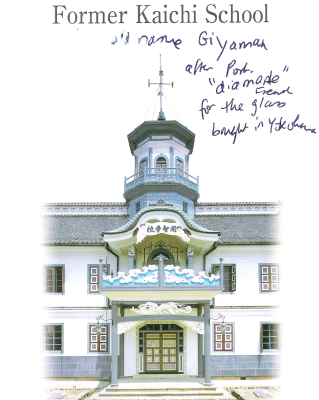 The words I scrawled on the front of this brochure say that the school was originally named "Giyaman," after the Portuguese word diamante, for the French glass that was bought in Yokohama. 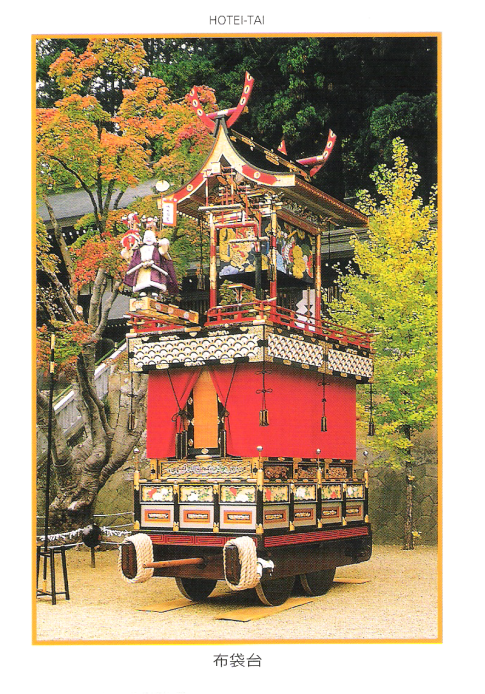 I was one of only two passengers on the Highland Express bus that afternoon from Matsumoto to Takayama, which takes a spectacular route through many tunnels with glimpses of beautiful rivers and villages in between. Other mountain roads I've been on, say in Mexico and Italy, have been somewhat scary due to the driving, but if anything this driver was too cautious, always the one to give way when two extra long buses needed to pass on a narrow curve. Takayama is really worth the visit, particularly the Antique Inn Sumiyoshi, where they allowed me a double room by the river because nearly all their eight rooms were empty. Elly had reserved dinner at 6 o'clock for me, which was served in the room. I wore a yukata after a luxurious bath. This meal was really a feast: I counted seven kinds of mushrooms, five kinds of seafood, Hida beef, and three kinds of flower (I decided one might not be edible), all arranged artistically in small dishes and served with house-made plum wine, rice, and green tea. I enjoyed chatting in Japanese (or attempting to) with the woman who served me. That evening I listened to the river flow by and wrote postcards. Breakfast included fried fish, poached egg, miso roasted on a dried magnolia leaf, and of course rice with nori. I borrowed an umbrella to explore the narrow streets. Takayama was a castle town that came under the direct control of the Tokugawa government in 1692, meaning the samurai left and the merchants flourished. I visited the morning market, the Takayama Festival Floats Exhibition Hall, and two restored merchants' houses from 1879 and about 1900. The postcard (left) shows one of the less gold-laden floats in their twice yearly parade; note the puppet lord with puppet gymnasts in the corner. I tried the local specialty, a soy-saucy dough-on-a-stick called Midarashi dango, and tasted one of the sakes at a brewery. Since I spent two nights, I also had time to see a museum of the special lacquered wood they make, Hida shunkei, and tour the Takayama Jinya. This complex of reception rooms, offices, courtroom, interrogation room with torture aparatus, and a huge rice storehouse from 1600 where tax payments were brought offers a rare historical look into the Edo government of 1692-1868. Monday morning the clouds lifted enough to reveal a bit of the surrounding mountains that hikers love (in better weather). As I arrived on the platform for the train to Nagoya, a woman approached me, asking in English if I had understood the announcement: The train was approaching the station, but would be delayed because of a signal malfunction down the tracks. The woman, whose English was very good because she works for the airlines, helped me book an alternate reservation on a bus. We were about to go get our train tickets refunded when we suddenly had to leap back on the train; the problem was fixed. The limited express train passed through the industrial town of Gifu, responsible for 19% of Japan's manufacturing. Nagoya station, famous as the train station with the largest area in the world (4,800,000 square feet), is sparkly clean and packed with tempting foods. There were long lines at the restaurant floors in the towers, so I went to a caf� called Danmark. Everything has a busy and prosperous feel. I can't imagine how it looked on Sept. 20, when Typhoon Roke arrived and people in Nagoya were wading in water up to their knees. I had planned an excursion to both Inuyama Castle and Museum Meiji Mura, but because it was late I made it only to the former. Someday I would still like to see the latter, kind of a theme park of 19th-century Japan. Walking through the new part of Inuyama was hectic with all the traffic and no sidewalks, but the old part near the shrine and castle was much quieter-until two fighter planes (perhaps F-18s?) from the nearby Air Self-Defense Force base flew in formation low overhead. I was the only person who looked up. A volunteer guide gave me another private tour to the top of this narrow tower (below left) with a glorious view of the river and other hills once occupied by rival castles. In Nagoya I stayed in a bare-bones business hotel of the Toyoko Inn chain. The following day I toured the large Toyota Commemorative Museum of Industry and Technology, which thoroughly covers textile and automotive manufacturing, ending with a darling trumpet-playing robot. I only had time to visit the shop of Noritake Garden for omiyage (a gift) before I rushed to the station for a quick sandwich and caught the shinkansen (bullet train) to Shinjuku station in Tokyo. I enjoyed the wide curve that this route takes, allowing us to see the beach, mountains, and cities from afar as we flew by. On Sept. 6 I reconnected with Sid on campus and we went out to dinner with Elly, her husband Tomoki, and their girls, 11-year-old Youki and 14-year-old Kaemie. One stop east of Musashisakai is Mitaka (which also has a bus to ICU), while two stops east is Kichijoji, an area with restaurants and shops. Tomoki had attended school in that town as a teenager, so he led us through the streets to a wonderful small restaurant that serves organic vegetables (raw with a miso dip or roasted, plus there was a yummy pumpkin puree) and fried fish. We all enjoyed the evening, amply accompanied by Suntory beer and tea. My last night in Japan I stayed at Oak Hotel in eastern Ueno district, the cheapest hotel of the trip at $58. My plane trip back included a four-hour layover in Seoul, not quite long enough for one of their organized tours for transiting passengers, but long enough to see an exhibit on the Korean traditional wedding, get a cultural guide to help me write Incheon Airport in Korean hangul, do email on a public computer, eat the spiciest meal of the trip (prawn ramen), and examine all the Korean goods for sale (mostly ginseng, snacks, and small toys). Arriving in Seattle at the same time of the same day I had left was interesting but somewhat grueling—I actually was up for 28 hours with just 2 hours of sleep—though I did get to see two feature films. Overall I reacquainted myself with Japan and things Japanese, and now I have to get out my reference books to translate the emails Sid has started to write to me! Copyright October 7, 2011 by Beth Chapple. All rights reserved.